Hey guys, happy Friday!! Today's post is very timely, because it's about the perfect summer skinny cocktail. And what better time to whip up a delicious drink than on a beautiful summer weekend? Great weather is finally back here in LA, and while I enjoy a good drink year-round, summer always has me review my drinking habits a little... This year, especially so. If you follow me on Instagram, you've probably heard about my current attempt to lower my sugar intake. When you're craving a good cocktail, that can be problematic. To be fair, I'm not really a huge fan of mixed drinks, I usually enjoy things like wine, champagne or a good beer. That being said, sitting poolside always has me craving a good piña colada. When I realized that a piña colada had about 50g of sugar, I totally freaked out! 50g is A LOT of sugar. Just as a point of reference, any low-sugar diet recommends staying under 50g of sugar daily... Which means one drink busts your daily max. Not only do most cocktails have an insane amount of sugar, they also have a lot of calories. That's why most people trying to loose weight are told to cut drinks first. To be clear, I'm not trying to loose weight. But during summer, I'm in a bikini almost every day, so I still try to be conscious of not overdoing it. While I don't believe in over-restricting myself or counting calories, there are a few simples tweaks that really make a difference. One of them is swapping a traditional cocktail, full of sugar and calories, with a skinny version. Not only do they help with weight management, but they also really reduce bloating, which is a bikini's worst enemy. On top of that, I feel like warm weather makes me crave something more refreshing and crisp than heavy, sticky, sweet drinks. Easy, right? Basically, I just take a glass, dump a shot of Vodka in it, and top off with a can of Lacroix. If I want to make it a little more elevated, I add a bit of frozen fruit to give it a little extra colour/flavour. Since 1oz of vodka has about 60 calories (and Lacroix has none), this is a 60 calories drink, with 0 sugar and 0 carbs. And that's really hard to beat. Because it contains so much water, it's also a really fresh drink that won't weigh you down, even in hot weather. It's super hydrating, and it takes care of drinking water while you drink, without any extra steps. Even when drinking a lot of those, I've never had a hangover. Surprisingly, the taste of vodka isn't overwhelming at all, so even if you don't love the strong taste, you can still enjoy this skinny cocktail. 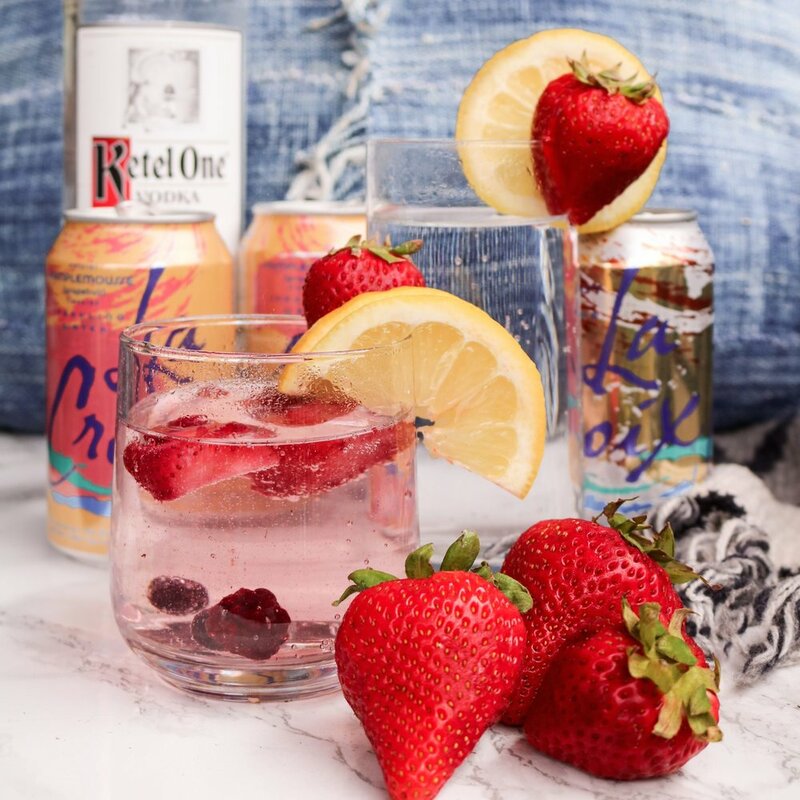 What I also love about it is that LaCroix water is available in SO MANY flavours, that you can have a lot of different drinks, so it doesn't feel boring. That's what I've been drinking almost every night in the Jacuzzi for a month or so, and I still don't feel like I'm aways drinking the same thing. Some of my favourite flavours are Cran-Raspberry, Passionfruit and Pamplemousse. And they all make a KILLER skinny cocktail. I haven't tried mixing different water flavours just yet, but I feel like adding Coconut to Mango would also create a really interesting flavour! What about you guys? What's your favourite LaCroix flavour? Are you down for these skinny cocktails? You can leave me a comment below or hit me up on Instagram. Let's share our most delicious skinny cocktail recipes for a fantastic summer! Wishing all of you a great weekend filled with delicious drinks!